Conor McLaughlin’s desire to fight through the pain barrier sums up the fantastic spirit at Fleetwood Town, according to head coach Uwe Rosler. McLaughlin picked up an ankle knock at Charlton earlier this month but, having missed only the goalless draw with Rochdale, the right wing-back recovered to feature and set up a goal in the League One win over Bradford last Tuesday, then start Saturday’s match away to MK Dons and help Town to win 1-0. The 25-year-old came off in the 65th minute at stadium:mk but Town boss Rosler said he was certain the Northern Ireland international, who has deputised as captain in the injured Nathan Pond’s absence, will be raring to go for Saturday’s home clash with Northampton Town. “I wasn’t sure he would last but he gave me everything ... unbelievable. 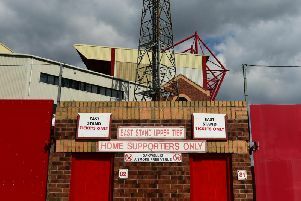 The postponement of next Tuesday’s scheduled visit to Oxford United means Town don’t face another midweek fixture until their March 14 visit to Walsall (with Oxford the only one after that) . And Rosler is relishing the chance to get some work done on the training pitch as his fourth-placed club bids to continue its improvement. He said: “I think we need a full week to work again on the training field because this group of players is not just ticking over – this group needs reinforcement work on the training ground. “That is what we do here and that is what makes us better. “I think I can see us going from strength to strength because this group of players needs reinforcement all the time. “The game schedule allows us to do that and some players need recovery. “We need to individualise the intensity and the amount of training. Town central defender and Saturday’s Gazette’s man of the match Cian Bolger was named in the EFL’s team of the week after his header clinched all three points away to MK Dons.